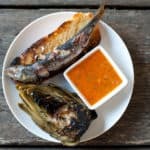 Grilled Artichokes are delicious and so easy! 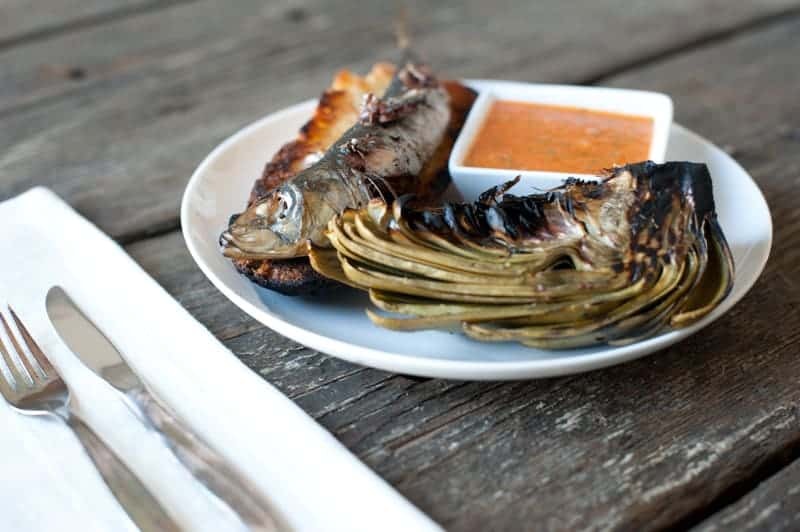 Get the how-to on artichoke grilling below, plus my favorite sauce to serve them with. Growing up, we spent a couple of weeks every summer on the California’s Central Coast, and as we’d pull off the Pacheco Pass on Highway 152, my grandparents would declare it was time to play “Name That Crop.” We’d drive for the next hour with my cousins and I screaming in the back seat: “Strawberries!” “Brussels Sprouts!” “Spinach!” “ARTICHOKES!” To this day, I swear I can spot an artichoke plant from a half-mile out. California grows 99% of the artichokes produced in the United States, with most of them produced in the central part of the state. They are harvested by hand, with crews marching through the field steadily cutting the mature bulbs and tossing them into huge fabric backpacks held open by metal frames. Harvesters have to know what they are looking for – under ripe artichokes won’t have much edible meat, and overripe globes will be purple and woody in the center. Crews may walk through the same field three or four times to get it fully harvested, and that’s after someone has walked through first to cut long-stemmed artichokes for florists and high-end restaurants. I know some folks choose to serve artichokes with mayonnaise or aioli, and they are welcome to. 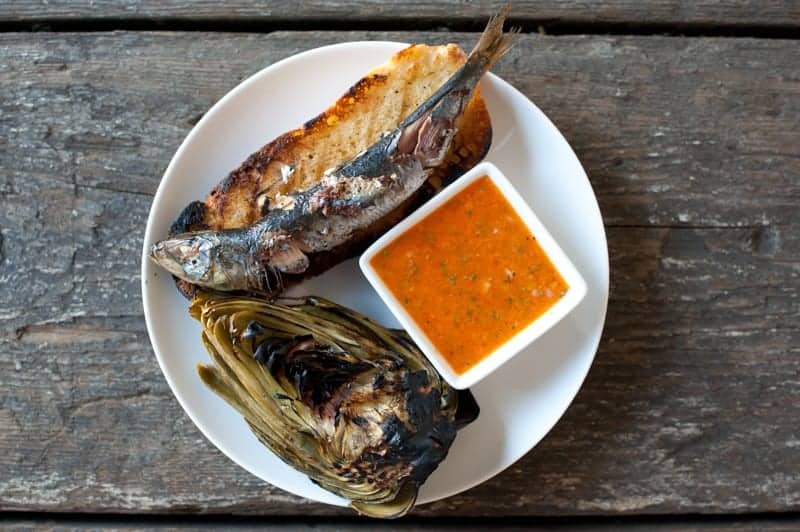 In my opinion, red pepper vinaigrette is the best partner for grilled artichokes – I’d probably pour it on a 2×4 and eat it if I wouldn’t get splinters in my teeth. It’s also my favorite salad dressing, so don’t be afraid to make a double batch and show the lettuce in your fridge some red pepper love. Fill a large bowl with cold water. Squeeze the juice from one lemon into the water, and throw the rind in too. Then cut the artichokes in half lengthwise, clean out the centers and place halves into the bowl of lemon water to prevent them from turning brown. In a large steamer over salted water, steam artichoke halves for 20-25 minutes. Meanwhile, prepare basting mixture of garlic, juice of the other lemon, and olive oil. Preheat grill. Brush the artichokes with a coating of the garlic dip, and place them on the preheated grill. Grill the artichokes for 5 to 10 minutes, basting with dip and turning frequently, until the tips are a little charred. Serve immediately, or hold at room temperature for up to an hour. Add peppers to food processor and puree. Stir in garlic, shallot, lemon juice, vinegar, honey, basil and spices; pulse to combine. Slowly drizzle in the olive oil until emulsified. This entry was posted in Dairy Free, Paleo Friendly, Recipes, Side Dishes and tagged autism diet, autoimmune disease, dairy free, dinner, g-free diet, gluten free, gluten free cooking, gluten free food, in season, kc cornwell, paleo, paleo friendly. Bookmark the permalink.